Zinnias bloom in a wide variety of colors with large, mixed blooms. 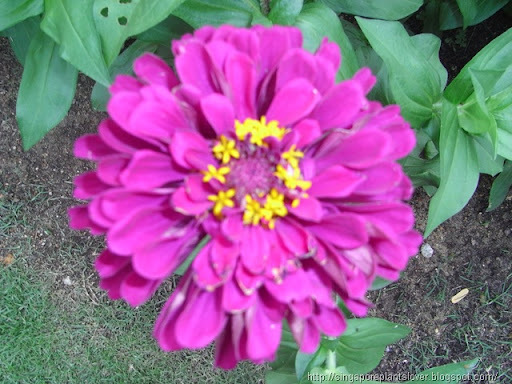 Zinnia flowers come in a rage of appearances, from a single row of petals, to the dome shaped variety. The brilliantly colored blooms perfect for cutting. Zinnia is one of the easy to grow annual flowering plants. The Zinnia plant's leaves are lance-shaped and sandpaper like in texture. 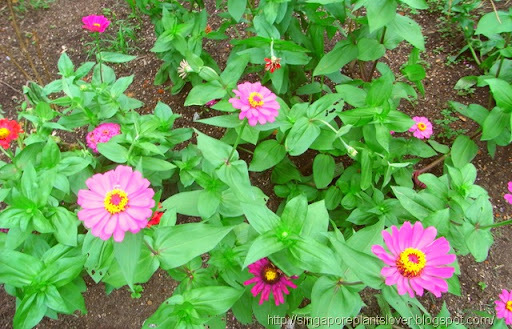 The Zinnia plant's height ranges from 15 cm to 1 meter. You can grow Zinna from seeds, or buy healthy, green plants from local nursery. Zinnias like rich, well-drained soil and it needs full sun for growing and flowering. Aphids can infest your Zinnia. Powdery mildew and molds can be a problem too, especially in warm, humid weather like Singapore. Apply insecticides or fungicides early. Butterflies are particularly attracted to Zinnias. The red and bright-pink varieties are especially attractive to butterflies. So, plant lots of Zinnias if you like butterflies visiting your garden!! But don’t plant Zinna next to your Calamansi Fruits tree. 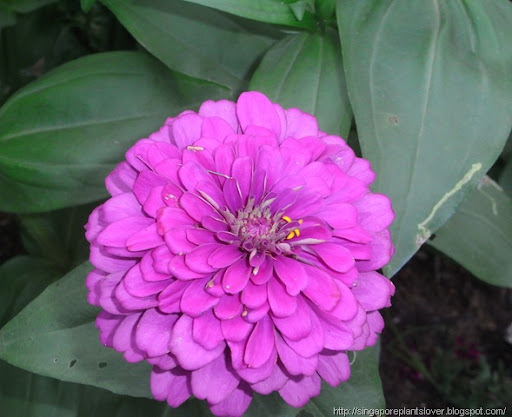 It's nice to see the zinnia featured in your post. Of course the intense pink is wonderful to see. What beautiful flowers, and stunning colours. Thanks for sharing. thanks for sharing such wonderful flower. 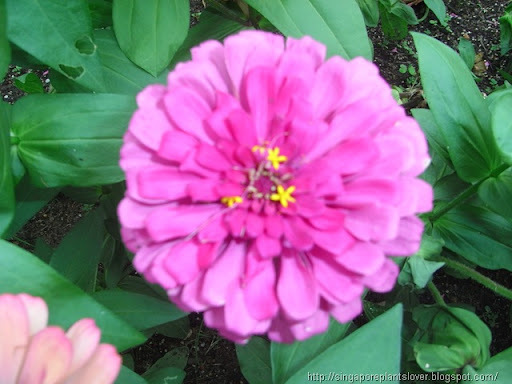 zinnia is one of most grown plant as summer annual in our climate. butterflies prefer semi double or single petal flowers but people here are turning more towards the double ones. still nice to see the blooms. and yap i have passed meme award to you. do check it out. Those are very pretty zinnias. You must have a green thumb to get them to do that well. I loved all your flowers. Pretty! How great of you to add tips for caring for them too. I love to see butterflies, i usually only see white ones, but in the last two days I saw two black/orange ones. Happy Pink Saturday and have a wonderful day! What pretty pink zinnias! I forgot to plant any! lol! Well, next year for sure as they are so pretty cut, too! Your zinnias are lovely and such a welcome sight on this gray day! Thank you for sharing them with us. Those Zinnia blooms are so beautiful! 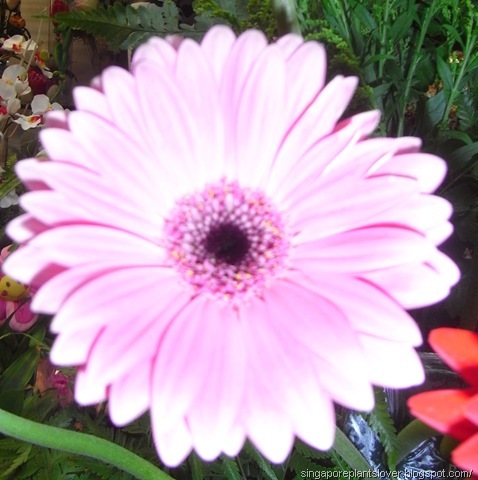 Thank You for sharing your Pinks! The zinnias you have photographed are vibrant and lovely. I hope you are having a wonderful day. Beatuful colors. Happy Pink Saturday!!! Happy Pink Saturday my friend. What a beautiful post. Flowers always light up a person's life and these zinnia's are beautiful. ~ Happy Pink Saturday. I love zinnias, but for some reason I have a problem growing them in Colorado where I live. No mater how much I water then the edge of the leaves turn brown. and they don't grow very big. ~ Fall is in the air here today. The high today is 58 and the low is going to get down in the 30's Time to bring in some firewood.